This lovingly grown pure white bean is the Queen of Beans! White flowering beans (shirohana-mame) are named after the delicate white flowers that grow along with these pure white beans. 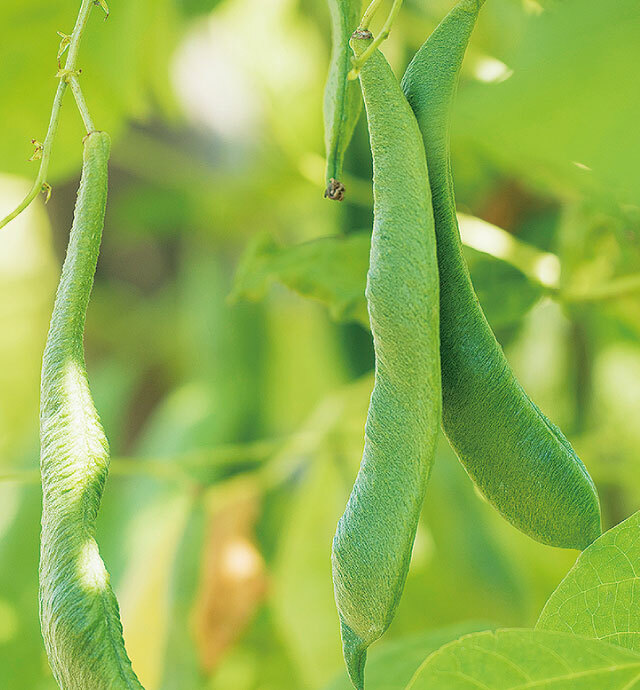 They are also called the “queen of beans”, and are considered a high-grade bean. Their vines grow over 3 meters high. Drive past the farms on Route 39 in summer and you’ll see their beautiful white flowers, as well as the red flowers of the purple flowering beans. 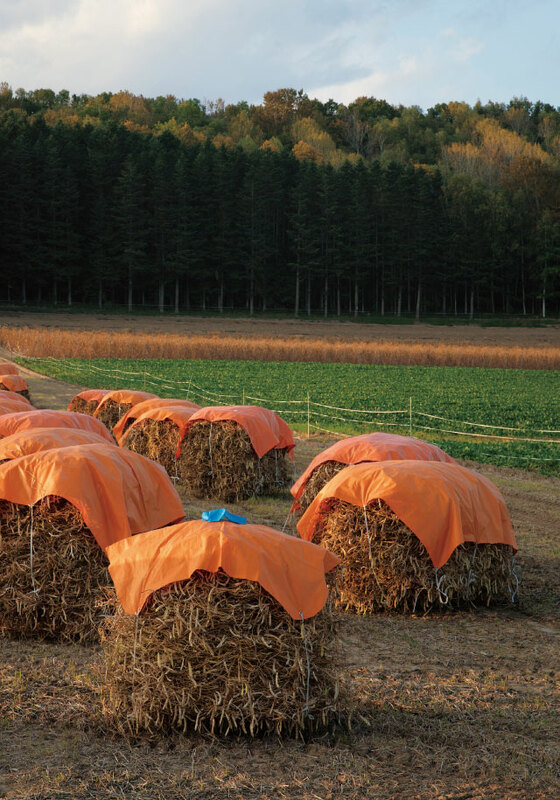 In the autumn, bales capped with blue or orange tents can be seen here and there. White flowering beans have been grown in the Rubeshibe area since 1955. With the cool climate providing the ideal conditions, white flowering beans became widely farmed, and the area now produces around 70% of Japan’s white flowering beans. Visit the Rubeshibe area and you can enjoy a variety of dishes and sweets made with white flowering beans. Rubeshibe farmers grow their white flowering beans almost entirely by hand, lovingly producing high-grade beans that are rich in nutrients. The Rubeshibe area is Japan’s top producer of white flowering beans…and the farmers grow them almost entirely by hand! They plant the seeds in spring, then when the vines start to grow, they set up stakes called metake to support them. Because the vines grow over 3 meters high, the farmers wind each vine around a stake by hand. By summer, the fields are full of white flowers. In autumn, the dead vines are removed from the stakes, arranged in bales called niotsumi and left to dry naturally for two weeks to a month. Many people balk at this process due to how laborious it is and how much manual labor is involved, but all the work and passion that the farmers put in just makes each bean all the more valuable. White flowering beans are considered a high-grade bean because of their rarity and high quality, but can be enjoyed at a steady price. These lovingly grown beans support a community. White flowering beans are highly nutritious, with plenty of minerals, iron, protein and fiber. They are mainly used as a base for white bean paste in Japanese luxury sweets, but can be found in numerous other forms of Japanese and Western style sweets, as well as various other dishes. There’s now even honey made entirely from Rubeshibe white flowering beans. Representatives from Oida Honey in Gifu Prefecture visit Rubeshibe every year during the flowering season of the white flowered beans to extract honey. 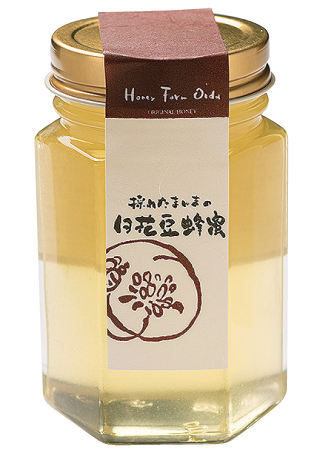 The 100% white flowering bean honey from Rubeshibe is sold at hot spring facilities in the area, such as Oehonke Hot Springs and Shiobetsu Tsurutsuru Hot Spring Store. Hiromi Moriya is the fourth generation of a farming family that has farmed in the area for over 80 years. Her grandfather, a member of the second generation, was the first in the family to start growing white flowering beans, and Ms. Moriya shares his strong passion for them. 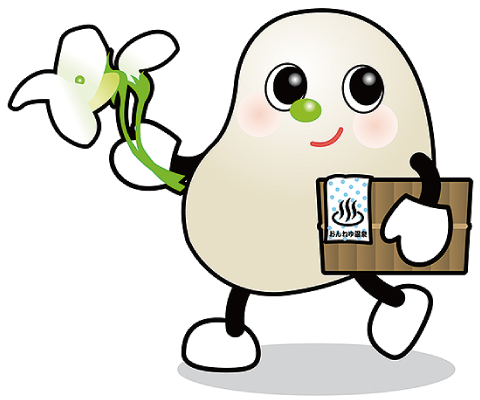 When Shirohana Mametaro (“Taro the White Flowering Bean”) was created as the mascot of the Onneyu Hot Springs Sightseeing Association, Rubeshibe’s white flowering bean farmers started the Rubeshibe White Flowering Bean Club along with members of various other industries. Formed in January 2015, the organization aims to promote white flowering beans to encourage wider consumption of the beans. Several days after the organization was formed, booths selling white flowering bean mousse and white flowering bean soup were set up in a local venue. 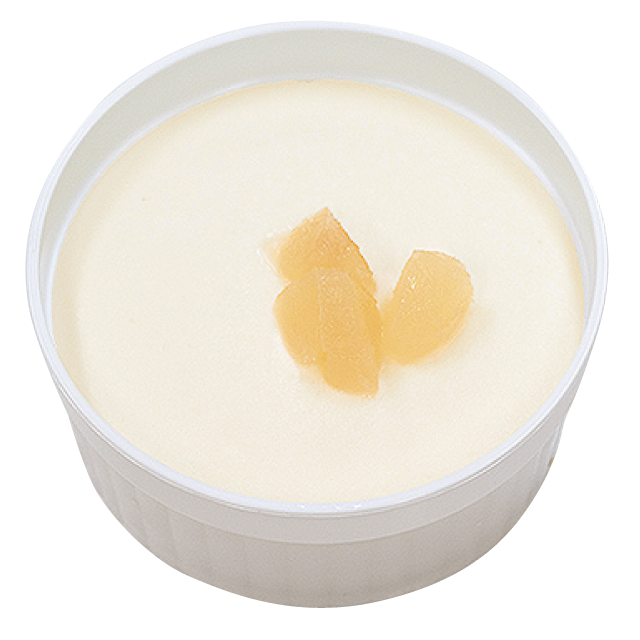 Made with white flowering beans and local milk, Rubeshibe’s white flowering bean mousse has a mild sweetness and a light, melt-in-your-mouth texture. It is made and sold at Fujiya Confectionery, a local sweet store.